The ultimate blend of performance and forgiveness! The X Series is about giving serious golfers total performance with enhanced forgiveness for the ultimate in confidence. 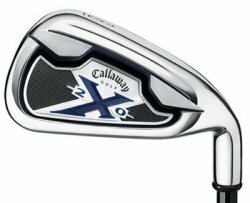 The new Callaway X-20 Iron Set delivers in every way by offering technology, innovation and playability that will take your game to a new level. From Phil M. of Rancho Santa Fe, California on 8/10/2007 . This irons are forgiving and provide the distance I need! 8/10/2007 – Do these irons come in graphite? Perfect Addition To This Set!